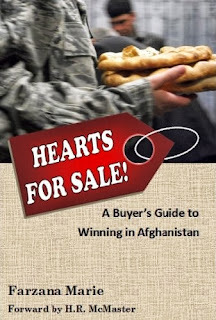 “Hearts for Sale! A Buyer's Guide to Winning in Afghanistan," by Farzana Marie, is an insightful look at the conflict in Afghanistan that will have even the most informed reader questioning what they have been told. Marie's 155-page book draws upon her six years of experience as an active duty military officer and her two years of deployment in Afghanistan, as well as her experience as a PhD student of Middle Eastern Literature. Marie's firsthand experience in Afghanistan is apparent in her writing, giving the reader a taste of what is really happening during the conflict. She incorporates descriptions of her firsthand experiences throughout the book, which makes the topics she discusses easier to visualize for the reader. The conflict in Afghanistan is complicated in nature, but Marie presents the information in a way that is easy to digest, without neglecting anything important, covering everything from politics to culture. Not only does Marie chronicle what is happening in Afghanistan, but she offers clear solutions to the problems. Overall, "Hearts for Sale! 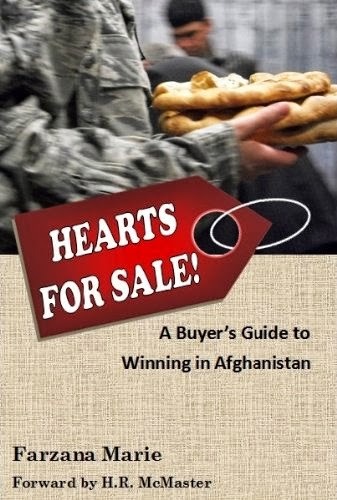 A Buyer's Guide to Winning in Afghanistan" is an incredibly informative and fascinating read that is a must-have for anyone interested in culture, human rights, politics, or the conflict in Afghanistan.